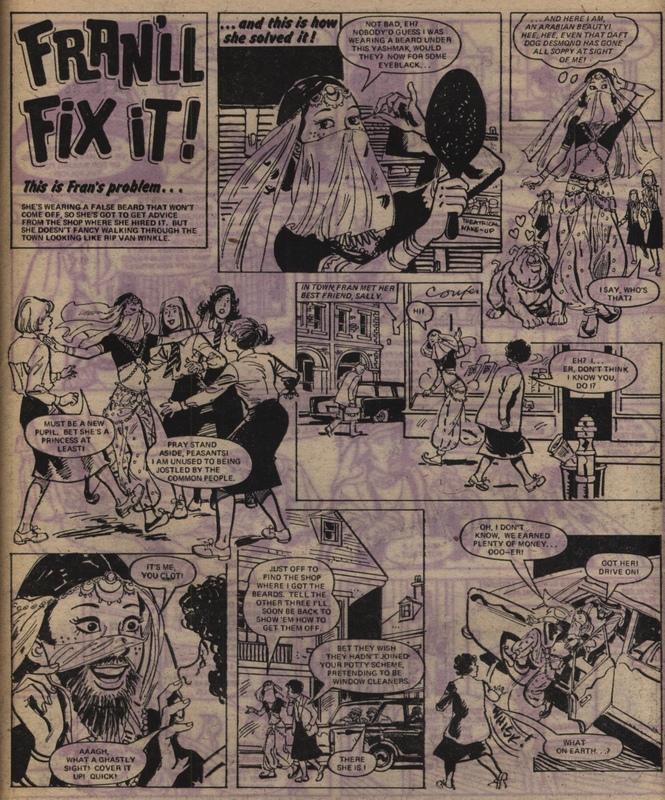 Tag Archives: Fran’ll Fix It! “Alice in a Strange Land: is the lead story at this point – Alice and her cousin Karen are told by the mysterious High Priestess that there is a prophecy that a “white-skinned goddess” will lead the tribe back to greatness. Will that goddess be Karen or Alice – and what test will decide between them? Sea-Sister Helen and her friend Jane are stuck in the ocean – Helen was trying to return to the underwater village that she comes from, but with Jane also on board her sea-shell boat it was not able to return properly. 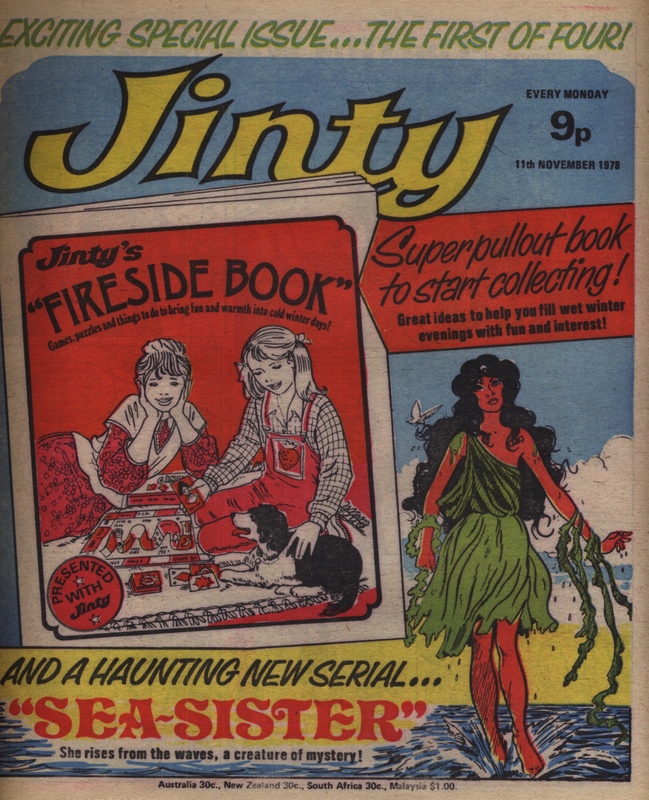 An oil tanker that is stuck on the rocks threatens the two girls, and also a number of friendly birds – Helen tries to save them all but in then end a giant wave sweeps the two of them overboard and under the sea. 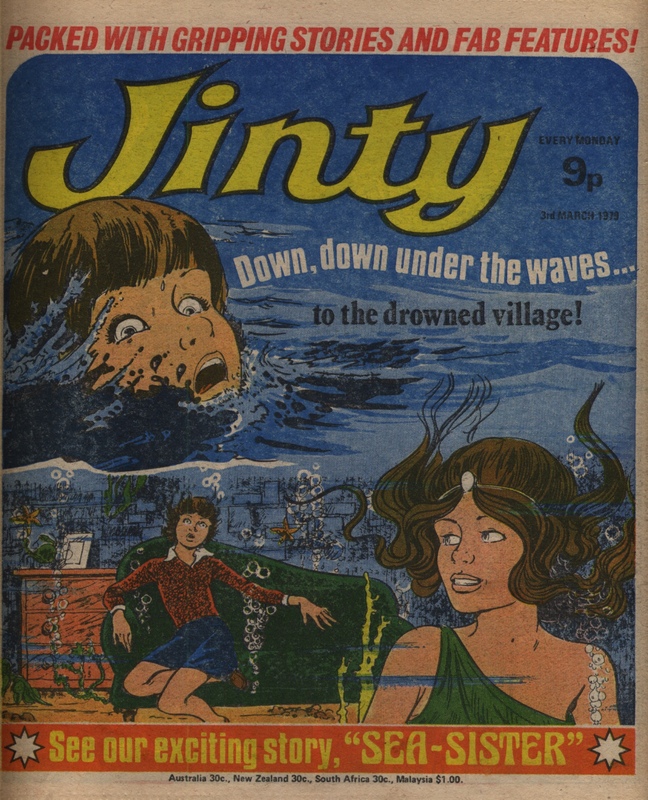 That’s fine for Helen, who is finally home again – but what of Jane, who has ended up visiting the underwater kingdom without permission? We normally haven’t touched on the features and extraneous items in the pages of the comic. 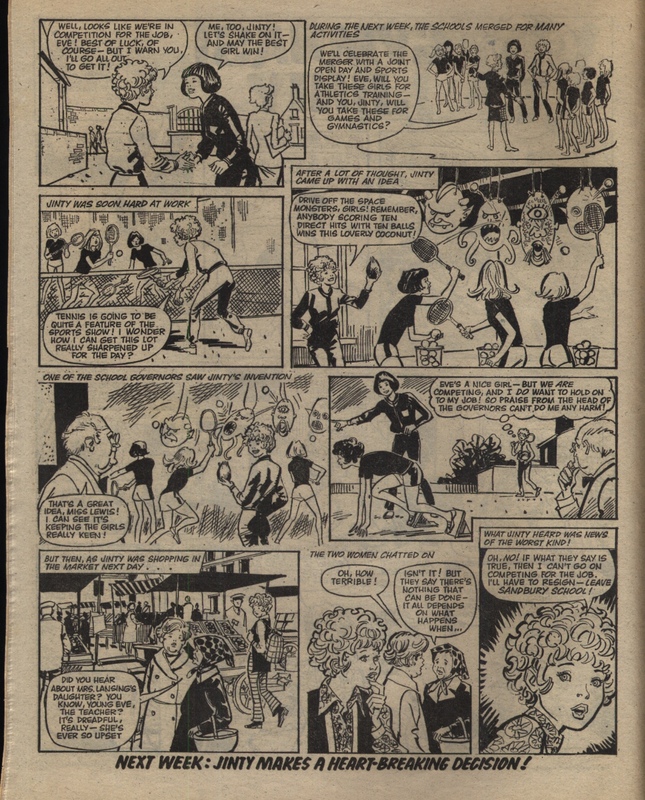 I include the page with the horoscope (and who better to present it than Gypsy Rose, of course – here drawn by Phil Townsend) and a crossword. 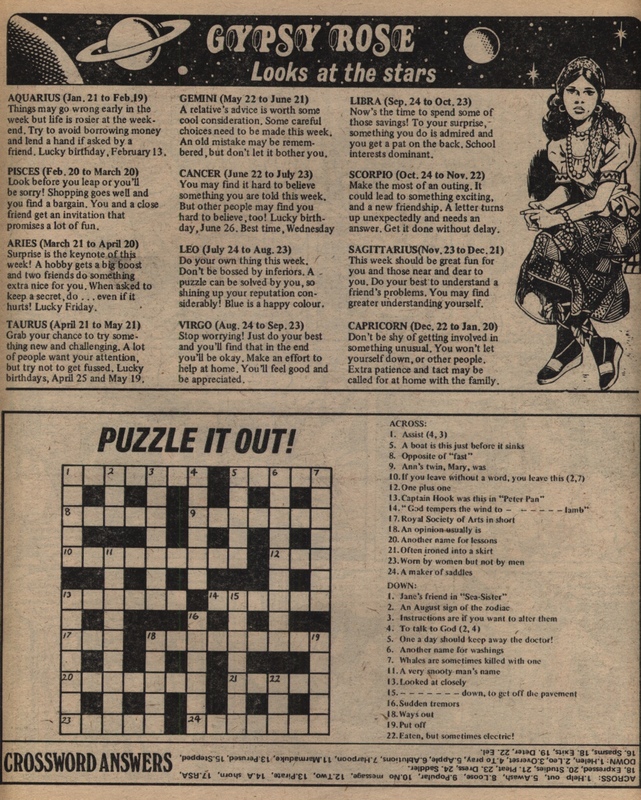 The clues on the crossword seem surprisingly hard for the intended age range of 8-12, I’d think: but have a look at the tiny upside-down answers, if you can, and see what you think. You will need to click through, of course. This is just the second episode of “Children of Edenford”. Patti has arrived at the clean and beautiful village of Edenford, but she knows that something’s not right about it. 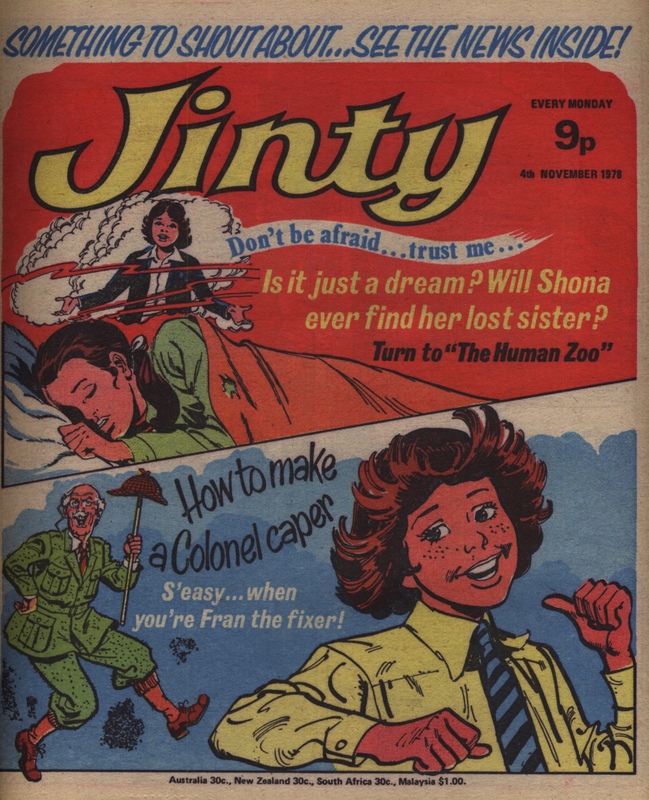 Well, the runaway terrified girl being pursued by grim blank-eyed schoolgirls, and the headmistress whose motto is “Others strive for perfection – we achieve it!” is a bit of a give-away, maybe. There is a two-page text article about a trapeze artist act, the Caravettas: three sisters and a brother. Very exciting! 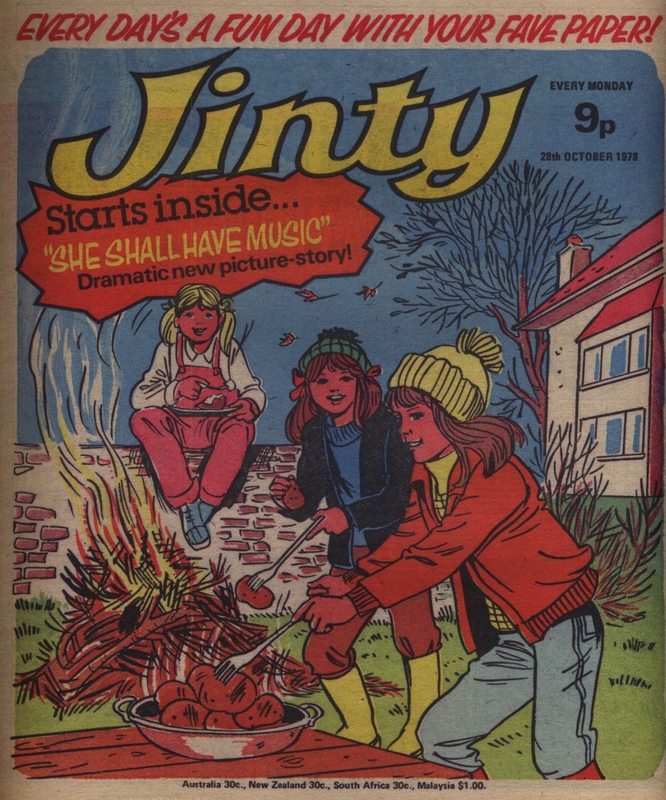 Fran is playing at being the Fire Officer, which is great fun, so long as she doesn’t screw it up badly enough that she gets into the Headmistress’s bad books, cos that would mean that big bully Martha Stump would have a chance to get her own back. Shy Ann has changed her hairstyle and other looks to match her dead twin’s – and the other girls on the school bus are understandably rather freaked out when they first see it. Being back at school after the traumatic holiday where her sister was drowned is difficult in many ways, however hard Ann tries. Tina starts learning how to do some magic in this parallel world – she learns how to float an object with her mind. She tries it out on the hockey pitch but the results aren’t entirely positive – she loses control of the ball and it heads straight towards the headmistress, at speed! Dorrie and Max are helped out by a passing war veteran who turns out to have been in the same regiment as their dad. He is very kind and feeds them at his own expense, but he can tell they are runaways – will he let the authorities know they are there? Cherry lands in the water, trying to rescue her first press clipping that she was aiming to send home to her mother. Her aunt and family are less than kind, leaving her in wet clothing and making her work in all weathers. No wonder she comes down ill after that. 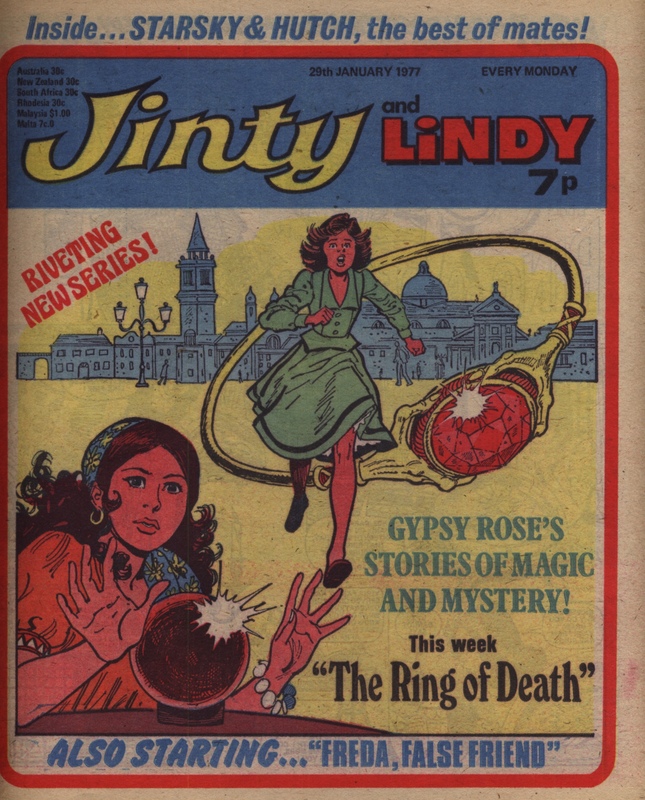 The Gypsy Rose story this week is clearly a reprint from an earlier title – Gypsy Rose is drawn in by another artist, in the chair where the Storyteller presumably sat. 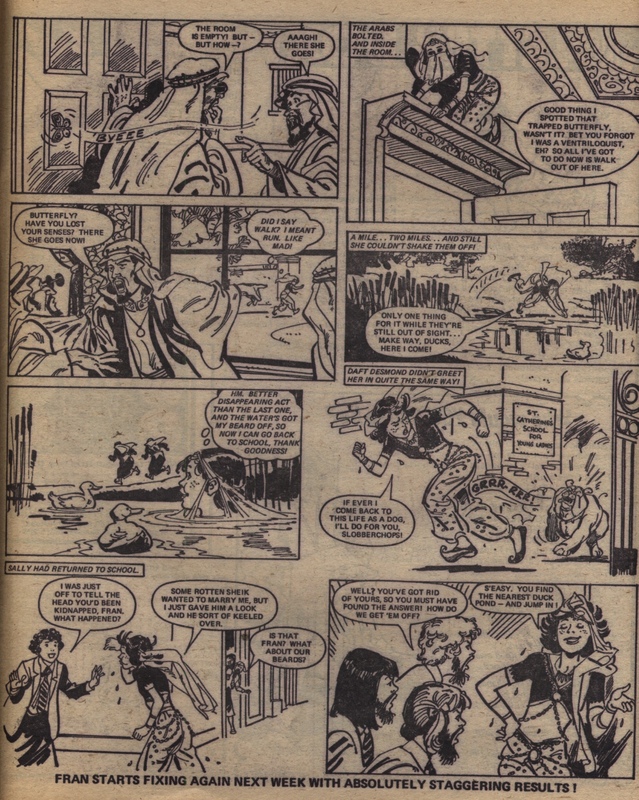 The in house artist who did this sort of work was called a bodger; this example is pretty well done, though Gypsy Rose’s face on the final panel is not quite as nicely done as it might be. In this story, wicked Lady Melissa possesses young Anthea once she starts using an old whip in order to play the ‘Georgian belle’ for a pageant. The Carstairs family move into a small terraced house and start to get used to their changed circumstances. Lisa starts at a new school, but refuses to change her selfish ways: she won’t help her mother clean the house, she squeals like a baby when she gets a splinter in her finger at school, and she leaves school in a temper when she is prevented from playing on the school piano. Shona encourages all the humans in hiding – her sister sends her a telepathic message showing her the way to a beautiful fertile valley where all can live in peace and safety. 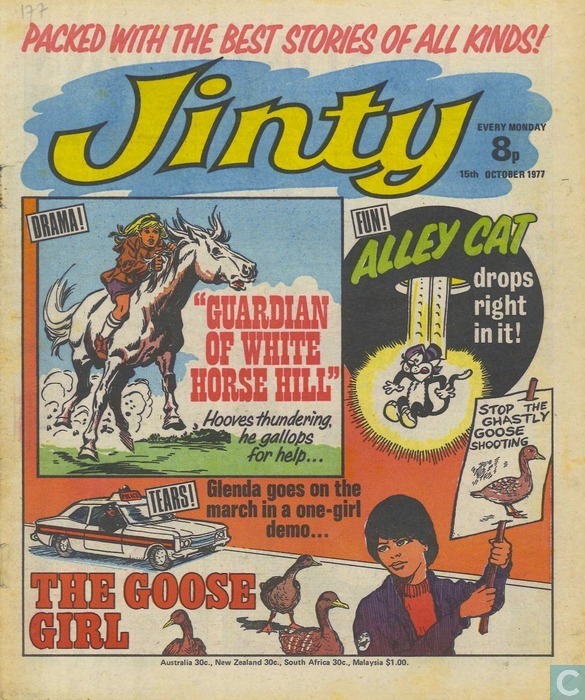 The cover image is drawn by Audrey Fawley – nice to see her in Jinty once again. Siblings Dorrie and Max are hiding out in an air raid shelter but have no food, and no ration books to get more. By the end of the episode, she has fainted with hunger and is lying in the snow! “No Cheers for Cherry” is pretty depressing. She is being dreadfully exploited by her cousins and aunt; her uncle is a little better but again is basically out for what he can get – cheap labour and a talented actress in their drama troupe. “Wild Rose” comes to an end – Rose finds out that the gypsy woman who had abandoned her all those years ago is really her mother, but to say so would be to cause unhappiness to the other baby in the switcheroo. Rose realises that her real happiness lies in going back to the family who brought her up – the circus family – and all ends well, because they have been scouring the area looking for her, too. Shona is free from the alien circus ill-treatment, but has to find humans who she can live with. Even out here in the wilderness, they are hunted down by the Silent Death, as these humans call the telepathic aliens.